If you go down to the market this month, you’re sure to find plenty of the green gems of Provence – Asparagus. 1. 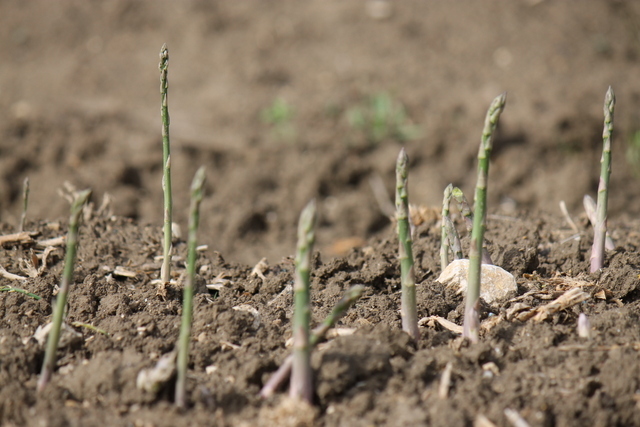 An asparagus shoot can grow 10 cm on a hot day. 2. There are three main types – white, green/purple, purple. The variety most commonly grown in Provence is green/purple. 3. Plants can produce for about 10 years before they need to be dug up and replanted. 4. Size – once the asparagus head pokes through the ground, the stem does not grow any thicker. A plant produces all thicknesses of asparagus. The thicker the stem the better the taste and the more expensive the asparagus. 5. A producer in Lauris in the Luberon once used to supply Asparagus to the Queen of England. 6. Harvesting asparagus is a tricky business, the stalks often grow close together and a slight nick with a knife on an under-grown neighbour ends its growth. 7. A single hectare of land can produce 4 tonnes in the 10 week growing season. 9. 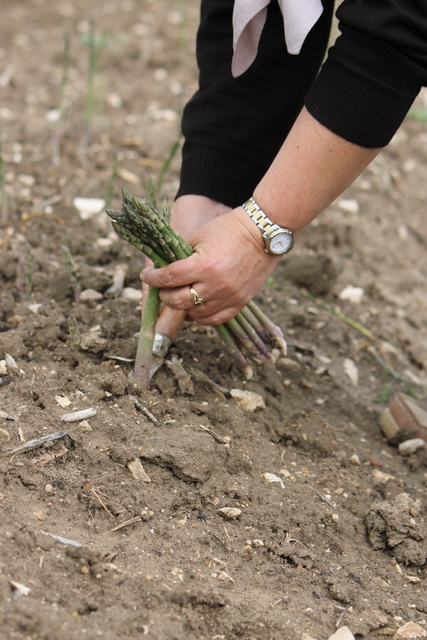 Newly planted asparagus plants need to be left fallow for two years to allow the roots to grow. 10. Asparagus is grown throughout France, but sunshine is really productive to the plant flourishing, hence the popularity of Provencal asperge. With thanks to Martine Bonhomme, Asparagus producer, Les Caravasses, Cornillon Confoux – Find her in Lourmarin, Cucuron and Senas markets on Friday, Tuesday and Saturday respectively.